I have made several attempts to write a one page summary of the OSI reference model, the model used to teach those who are new to networking how computers use the internet to communicate with one another. I keep failing at this task. The problem with writing an easy to read summary on the OSI model is that the way that computers talk to one another is complicated and abstract. Thank goodness that these machines aren’t sentient! I was able to illustrate how the model works by charting out each step from the human input to how the computer would process each step. This chart is VERY simplified, but I feel it gives a basic idea of what happens behind the scenes when we want to access anything on the internet. 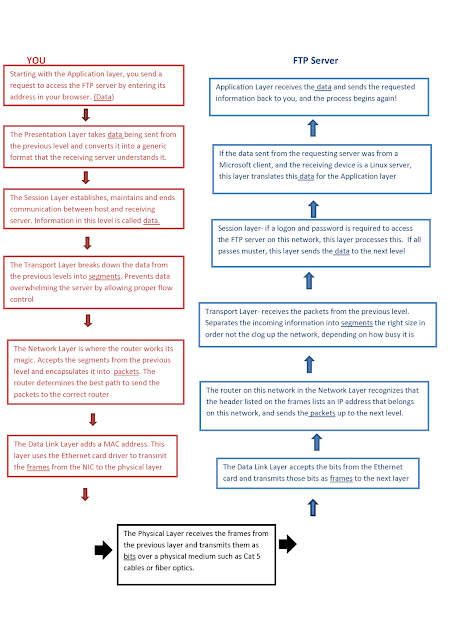 The red side of the chart is what happens when you begin with the application layer and move down the model, the blue side is what happens when the data moves up the model, and the black part is the physical layer that separates the red and blue sections. The underlined words are what protocol data units (type of computer information) are called in each layer. Something that I didn’t mention in the chart but it’s good to keep in mind is that when the data is moving down the model, each layer adds its own header with an address on it, and this is called encapsulation. When the data moves up the model, each layer removes the header that comes with their PDU and that is called decapsulation. Tomsho, G., Tittel, E., & Johnson, D. (2007). Guide to Networking Essentials. Boston: Thomson Course Technology.